→ Real Arcade Play: Achieved! 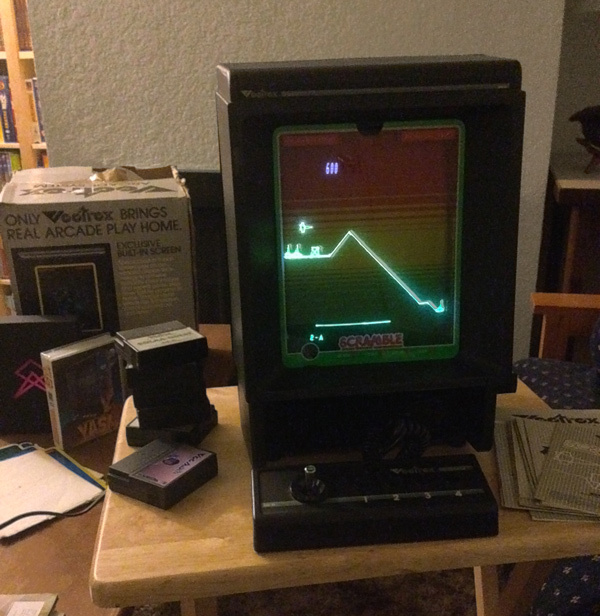 Huge thanks to Albert for hooking me up with this Vectrex! This is a pretty sweet unit - very clean, works great, solid controller, and it included several games and overlays (gotta have the overlays). I've been wanting one of these since, well, since the early 80's when I first saw them in stores. More recently though (like, ten years ago) Alex Herbert sent me copies of a couple of his Vectrex homebrews as a thank-you for work I did on the manual and label for his as-yet-unfinished 2600 homebrew: Man Goes Down! Unfortunately, I had nothing to play them on. Even more recently, I bought one of Richard Hutchinson's VecMulti carts, as I got ever closer to acquiring one of these puppies. Finally, it's here! Now I just need to get a microSD card reader (so I can use Darrell's Mac port of MenuMaker), and scrounge up some more games. Yeah - Juno First would rock on this! I was surprised at how much larger the controller was than I remembered. It's a really nice, solid piece. The left-handedness of it doesn't bother me so much (like gamepads do) since they put a really nice joystick on there (unlike say, the Atari 5200 or PlayStation Dual Schlock). But most of the games I'm playing so far just use the joystick for rotating left/right. It's been so long since I've played Space Wars I'd forgotten the ships took on damage! It was one of my favorite early arcade games, and it's great to have it at home in its proper vector-y goodness. So far it's been working really well, except the cartridge slot is a little fussy. I have to slightly prop up some games for them to make solid contact (the cartridges themselves appear fine). Once in place, they play great. My VecMulti, on the other hand, crashes the Vectrex. It will load the menu, and I can select a game, but as soon as I do, the screen goes completely black and then... nothing. I have to shut off the Vectrex and when I do, I get a single dot that fades out (like old TV sets used to do... those were the days), which doesn't happen any other time I shut off the Vectrex. It also seems to leave it in a slightly wonky state where subsequent games will shut off (but it could be the fussy cartridge slot). After unplugging it and plugging it back in it's fine. But the VecMulti behavior is consistent, so I'll have to ask Richard about it. Sweet! I've enjoyed the emulated games in the Vectrex ipad app. With the help of an 8-bitty controller I can get pretty far in Scramble but always lose it at the deep dive in the square caverns. I love Vextrex almost as much as Vectrex Roli! I have my original, its Canadian model backup, one I bought to attempt repair, one for parts, and one I got off eBay that was going to sell way to low, and finally I bought a new in box controller, except it wasn't new, the one on the console they were selling was the "new" one so I just ended up getting the system also. The analog joystick would add the ability to tiptoe, walk, jog or run. And four buttons would let you jump, throw, duck and... hyperspace? Um... well, something.